Heat olive oil in a skillet. Cook beef, sausage, onion and garlic over medium until onion has softened and meat is cooked through. Stir in tomato sauce and basil. Cook for 20 minutes over medium heat, stirring occasionally. Turn off heat and add salt and pepper. Make Filling. Mix together mozzarella, ricotta, parmesan and egg until thoroughly combined. Set aside. Make Béchamel Sauce. Melt the butter in a saucepan. Whisk in the flour and cook, whisking constantly. (This is called a Roux.) Cook until the roux cooks and bubbles. Do not brown. Add the milk, continuing to whisk as the sauce thickens. Bring to a boil. Then lower heat to simmer, add salt and cook for another 2 minutes, stirring constantly. Assemble Crock Pot Lasagna. Spoon 1 cup of meat sauce in the bottom of a small crock pot. 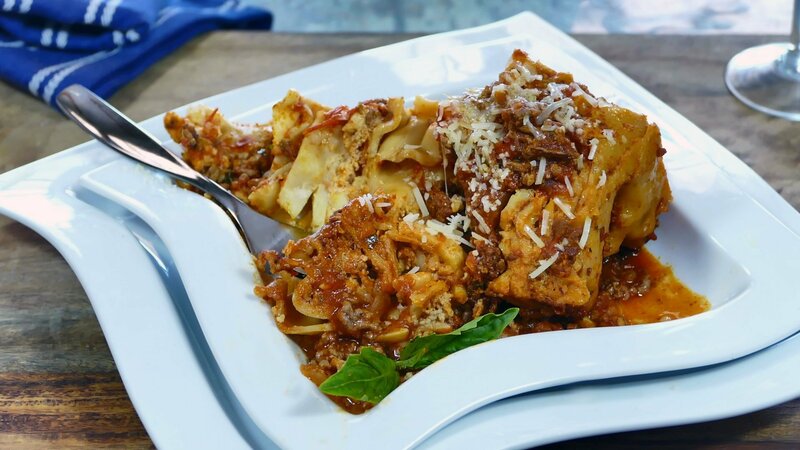 Break raw lasagna noodles and lay them on top of the meat sauce, overlapping. Spoon a layer of cheese filling over noodles. Spoon a thin layer of béchamel sauce over cheese filling. Repeat layers until crock pot is filled (leaving about ½ inch of room at the top.) Sprinkle ½ cup mozzarella and ¼ cup parmesan on top. Cover and cook for about 5 hours or until noodles are cooked and tender.